Find Bluffton Realtors and homes for sale near me in Bluffton, SC at Steve Wallace Real Estate online. These days, many Google searches seek local information. In fact, there has been a whopping increase in “near me” searches online. Folks are searching for restaurants near me, banks near me, dentists near me… Realtors near me and homes for sale near me. Near me – is no longer just about finding a specific place. It’s now about finding a specific thing like “find cocktail dresses”, in a specific area like Bluffton, and in a specific period of time such as at the holiday season. Consumers now expect mobile and digital voice search technology to find the places in their area where they can get products and services they need. Certain types of searches have increased dramatically according to Google which noted car-dealer related searches near me have increased 200% and mobile searches for dress-related near me searches have increased an amazing 600%. These types of stats mean that now, more than ever before, local search engine optimization (local seo) presents significant growth opportunities for Realtors, real estate agents, real estate agencies, brokerages and every small business. 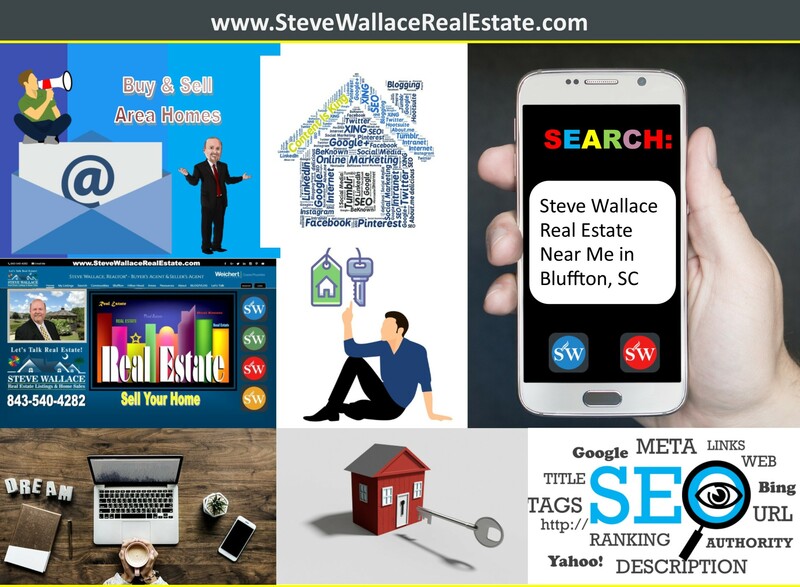 Not only is local seo an especially effective way to generate visibility for Steve Wallace Real Estate, it also helps us boost site traffic to our online Greater Bluffton SC real estate website, increase engagement and drive sales. At Steve Wallace Real Estate, with Weichert Realtors Coastal Properties, we’re near you helping you buy and sell homes. We service all Greater Bluffton areas of the South Carolina Lowcountry which include Bluffton, Callawassie Island, Hilton Head Island, Okatie, Sun City Hilton Head and surrounding areas. We provide realty services for folks buying homes and selling homes in all our smaller neighborhoods and all our larger plantations. We’re at your service for residential real estate and our real estate website is available 24/7. 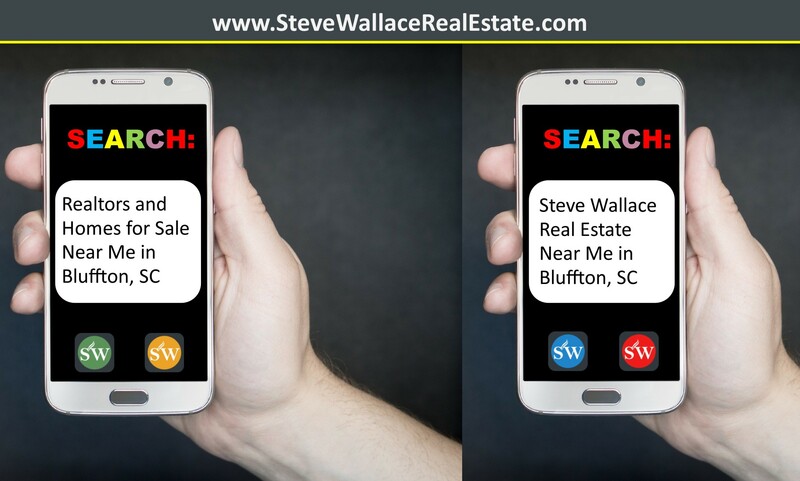 Relocating home buyers and sellers can find the right data and the right answers to many questions on our site and by connecting with resident Realtor, Steve Wallace, licensed South Carolina real estate agent. Who do I call to sell my home? Who do I call to buy a home? While many traditional searches have been performed by typing a search query on your desktop, laptop, notebook, tablet and smartphone computers into an online search box, digital voice search has become increasingly popular. Amazon’s Alexa, Google Home, Apple’s Siri and Microsoft’s Cortana dominate the market in digital voice assistants. Whether you are performing a search query by typing into a search box or speaking, remember Steve Wallace Real Estate is nearby when it comes to Greater Bluffton SC real estate and homes for sale in Bluffton, Callawassie Island, Hilton Head Island, Okatie, Sun City Hilton Head and areas beyond in the South Carolina Lowcountry. The searches “near me,” “closest,” and “nearby” have become hugely common, and have increased at an exponential rate. The word “exponential is generally used as an impressive adjective to imply something happening really fast and getting faster… and that is the case with “near me” related searches. Google Trends Data notes many general location related searches including; coffee near me, nearby movie theatre, closest car wash… The vast majority of folks using “near me” in their search have searched for food, entertainment, banking, apparel, personal care… When it comes to Greater Bluffton, South Carolina real estate, Realtors, homes for sale and realty services, simply type or announce into your digital voice search device, “Steve Wallace Real Estate.” We are the search result you need to achieve your local real estate investment and home goals.